NASA's Mars Reconnaissance Orbiter has relayed new data showing Mars was once drenched with water, and for hundreds-of-thousands of years, reports the BBC. Images from the Mars Orbiter show minerals on the "ancient highlands" that only form in water. 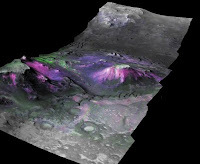 The same type of minerals also appear in-and-around craters and on the slopes of dormant volcanoes (see image) suggesting evidence of a wet Mars has been hiding just below the surface. And the evidence runs deep, up to 5 kilometers down, suggesting there was a lot of water on the Red Planet. Mars' wet period probably ran from 4.6 billion to 3.8 billion years ago during the planet's "Noachian period."